Since the mid-1990s, the Australian immigration programme has undergone a ‘paradigm’ shift to encourage skilled migrants to settle in regional Australia. The success of this programme is dependent on not just attracting increasing numbers of settlers but more importantly on retaining them in the long run in regional Australia. In this paper, we argue the importance of social connectedness for long-term stay in a particular place and empirically examine the determinants of social connectedness in regional Australia. We use the data from a national survey of 500 randomly selected principal applicants who migrated under the regional sponsored migration scheme. We derived a composite measure of social connectedness from responses to five questions about regular participation in various community activities. Logistic regression models were employed to examine the factors that contribute to social connectedness. Of all the covariates included in the model, five were critical for strong social connectedness. The families with young children, those who have lived in Australia longer, those living in small towns and those who were born in the USA/Canada, South Africa and Zimbabwe showed much stronger social connectedness than others. Another interesting finding was that those who found the assistance they received from their employer sponsor upon arrival helpful were also more likely to have strong social connectedness. The paper concludes with the policy implications and future research directions on this very important social issue. The authors would like to acknowledge and thank the Research Advisory Committee of the Standing Committee on Immigration and Multicultural Affairs (SCIMA RAC) for allowing access to the original unit record files of the RSMS telephone survey for our analysis. We would also like to thank the Monash Institute for the Study of Global Movements and the Department of Victorian Communities for financial support, which allowed the authors to participate in two research workshops for this project. (DIAC) Department of Immigration and Citizenship (2007). 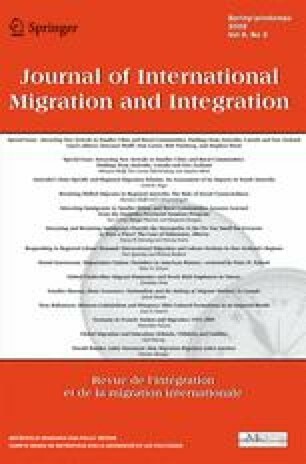 New migrant outcomes: results from the third longitudinal survey of immigrants to Australia. www.immi.gov.au/media/research/lsia/lsia11. (DIMIA) Department of Immigration and Multicultural and Indigenous Affairs (2005). Survey and analysis of the Regional Sponsored Migration Scheme. www.immi.gov.au/media/publications/pdf/rsms-paper-final.pdf. Withers, G. & Powell, M. (2003). Immigration and the regions: taking regional Australia seriously. Chifley Research Centre, www.chifley.org.au.